McKinney, Texas Real Estate and Community Info. Homes for sale in McKinney, Texas, have always looked attractive, but in 2010 they became supermodel gorgeous when CNN Money ranked the community No. 5 on its “Best Places To Live” list. This charming suburban Dallas/Fort Worth community boasts a beautiful downtown, including historic buildings attractively converted to new uses. Its courthouse, built in 1875, now houses a performing-arts center, and there are numerous passionately refurbished 19th century buildings containing restaurants, art galleries and boutiques. There are more than 100 distinctive shops and at least a dozen magnificent dining establishments within in the Main Street section of downtown McKinney. Visitors and residents of McKinney might be tempted to say that the town’s specialty shops are its specialty. Awash in unique furniture stores, exquisite antique shops, art galleries and home décor outlets, Historic Downtown McKinney is truly a stunning and stylish place to be. The City of McKinney’s Parks, Recreation and Open Space Department manages a wide range of parks, trails, aquatics and athletics facilities, in addition to running popular adult and youth sports programs and senior centers. Throughout the year, McKinney’s residents are treated to a plethora of special events, including the Easter Egg-Stravaganza for kids of all ages, Jammin’ in June for live music in the park, and Bike the Bricks for an exhilarating bicycle ride through Historic Downtown McKinney. If you’ve ever dreamed of living in a town that has all the entertainment choices of a big city mixed with the Victorian-era charisma of a small country village, you’ll find McKinney has a special allure. The town square is home to entertainment offerings like the McKinney Performing Arts Center, carriage rides and enchanting live performance acts. With such a cozy community it’s easy to understand the appeal of homes for sale in McKinney, Texas. McKinney Independent School District offers outstanding quality public elementary, middle and high schools. 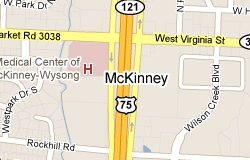 In a 2006 Newsweek ranking of U.S. schools, McKinney High School ranked 191st and McKinney North High School came in at 237th out of 1,000 schools. With the Medical Center of McKinney, Methodist McKinney Hospital and the Baylor Medical Center at Plano nearby, local residents have plenty of choices in healthcare facilities. Public transportation options for McKinney residents are headlined by the Collin County Area Regional Transit (CCART) system, which offers a range of vehicles including passenger buses and sedans.